Oscar-winning screenwriter Steve Zaillian has earned a reputation as the King of the Adaptation with some of his past work including Steven Spielberg’s Schindler’s List, and that rep should continue with his screenplay for David Fincher’s The Girl with the Dragon Tattoo, out on Tuesday, December 20. 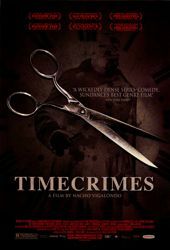 When ComingSoon.net sat down with Zaillian to discuss it earlier today, we got around to some of his other projects including the proposed English remake of Nacho Vigalondo’s Spanish cult classic Timecrimes for DreamWorks Pictures. The remake actually came up recently when we spoke with director David Cronenberg, who denied any involvement with the project, but we learned that Zailian himself is toying with directing it. We also spoke with Zaillian about his adaptation of Khaled (“The Kite Runner”) Hosseini’s A Thousand Splendid Suns, which he had been lined up to adapt over four years ago. Look for the rest of our interview with Steve Zaillian sometime next week.